Drilling perfectly perpendicular holes is a common woodworking and carpentry task. Big Gator Tools offers what is probably the simplest jig for getting a perfect result every time. The V-DrillGuide is so versatile in its application, that it should be in every woodworker's toolbox. As the name suggests, the V-DrillGuide guides the drill as it completes a cut. The drill bit fits into one of the holes of the jig with such precision that it becomes impossible for the drill bit to move in any other direction but up and down. 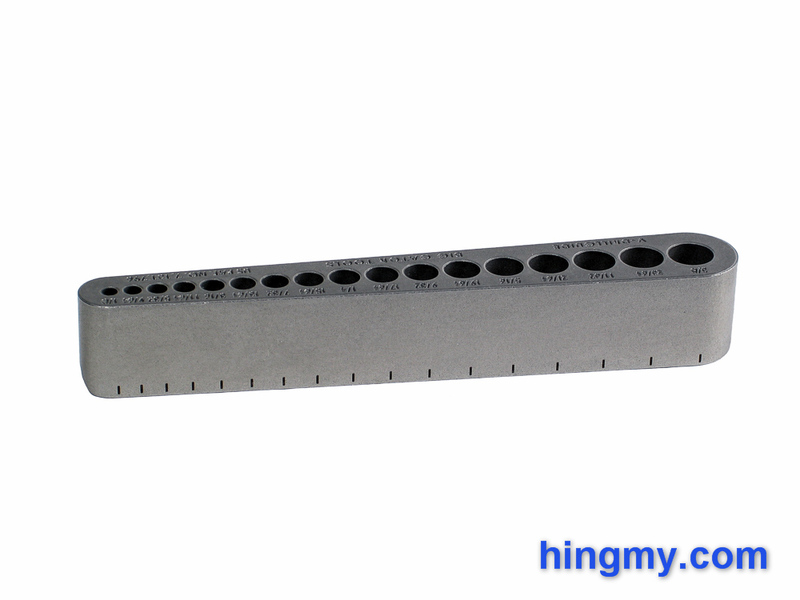 To drill a hole, the user simply has to clamp the jig down and drill the hole. Free hand drilling without a clamp is possible, but is not nearly as easy to do. The V-DrillGuide is worth writing about, because it has a transformative effect on how we work. Every one of us has eye-balled a hole that needed to be square and called it good enough. All the tools we had to do the work properly did not get used for one reason or anther. The V-DrillGuide changes all that. It lives in the toolbox until it is needed. When it is time to do work the guide adds only a few seconds to the time it takes to drill a hole, and the result is always perfect. That's exactly how a good tool should work. It takes little time to use, and it is very hard to mess up. The V in the name of the guide comes from the V-groove cut into the bottom of the jig. 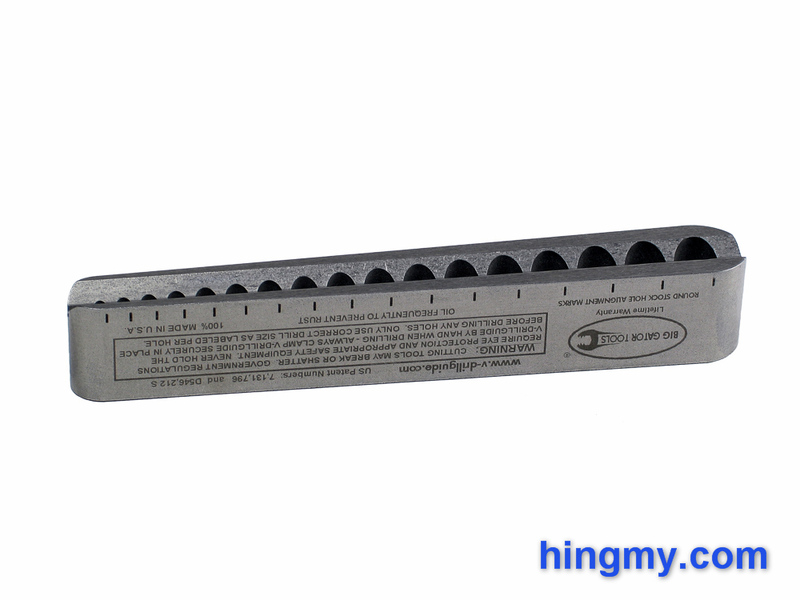 This groove makes it possible to position the guide on round stock and square corners without any movement. Metal workers working with tubing will find this feature particularly useful. The guide's small size make it not only portable, but also usable on the jobsite. There are few places too small for the V-DrillGuide. Any error will come from positioning the jig. Tick marks on both sides of the jig indicate the center of each hole. Without layout lines they are hard to use. Correctly positioning the jig with a bard-point bit as a center-finding tool seems to be the simplest method. The tapered walls of the guide make it very hard to position the guide relative to a fence. The distance from the center of each hole to the outside edge of the jig varies from hole to hole. The V-DrillGuide comes in both metric and standard sizes. 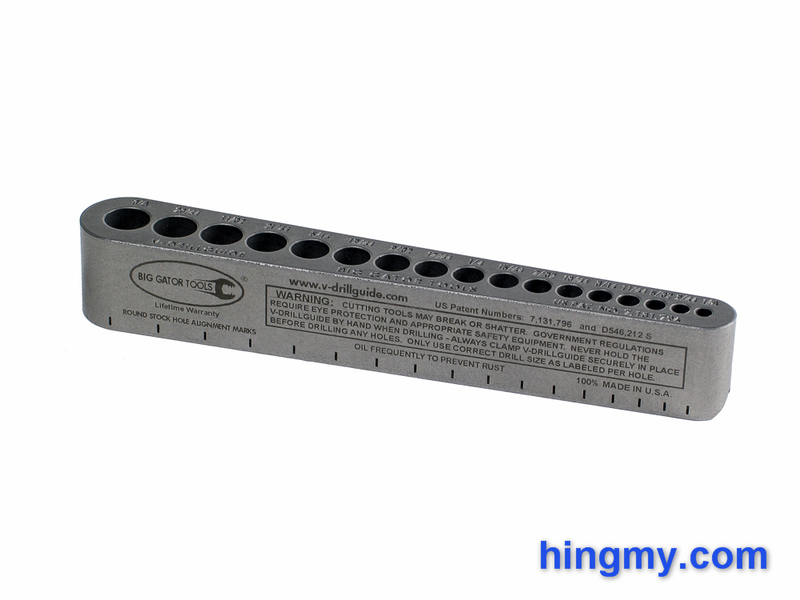 If you work with metal, take a look at the Big Gator tap guides as well. They are built to the same exacting standard as the V-DrillGuide. The price might seem a bit steep at first for what is little more than a piece of metal. If you look closer you'll see that you are buying a top quality tool. Big Gator covers their drilling and taping jigs with a lifetime warranty. Chances are that the Big Gator Drill Guide will be the last drill guide you'll ever buy. Not to mention, the jig is being made in the United States. The guide will not rust if you remember to keep it oiled. Since oil can interfere with finishes it's better to skip that step when you are working with wood and keep the tool in a conditioned space where humidity is not an issue. The solid construction makes it nearly impervious to mechanical impact. Short of a sledge hammer I can't think of anything that would bend the V-DrillGuide. If you are careful to only use the correct guide holes for each drill bit, the walls of the holes are safe from the bit itself. After a decade of use this guide will show little more than a few surface scratches from bumping into other tools in your tool chest. The V-DrillGuide is a simplistic tool that fills a very real need. You only have look at it to understand how it works. The guide produces perpendicular holes at machinist precision. It takes only a few seconds longer to drill a hole with the guide than it would take to drill the hole free-hand. The V-DrillGuide takes up little room, can be used on the jobsite, and is always at hand. Big Gator's model is by no means the first drill guide, but it is a particularly well built model that will probably outlive yourself. For a lifetime of perpendicular holes the price of the V-DrillGuide is a bargain.